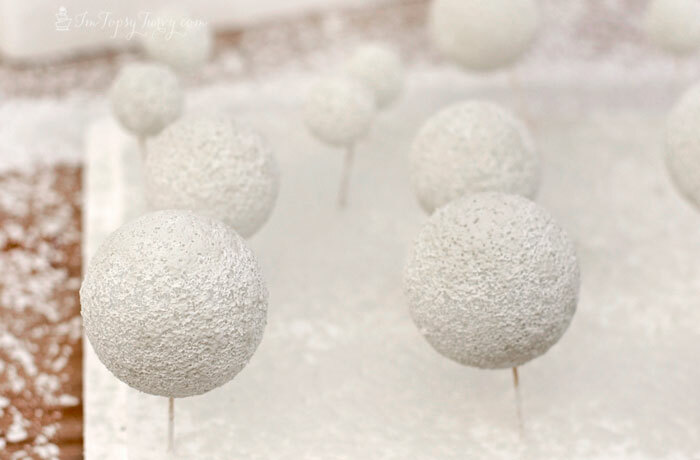 Instead of using normal holders for all the food labels I thought it would be more fun to create fake snowballs to hold them! 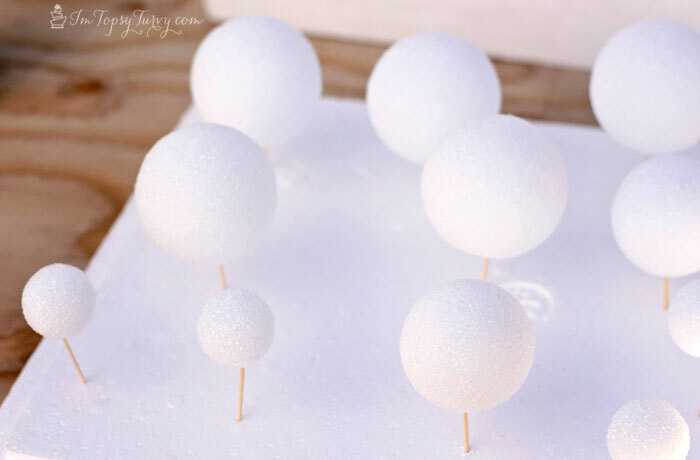 I also wanted to have some snowballs of different sizes on the tables for extra fun. If you use a regular spray paint, or snow type paint, will actually eat the styrofoam, so the best way to go is an oil based paint. I used the same orange peel spray paint that I did for the pine trees. 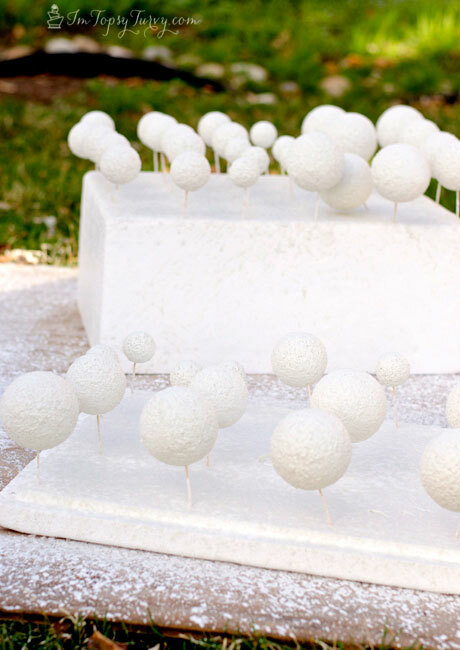 I put all the balls onto toothpicks and stuck them into a styrofoam box I had lying around. This was another great job for the kids! So much of this party was stuff the kids could help me with and it was SO much fun having their help! Make sure you do this in a well ventilated area, personally I just did it outside on my long grass. After two coats I flipped each ball to the other side and did another two layers on the other side! 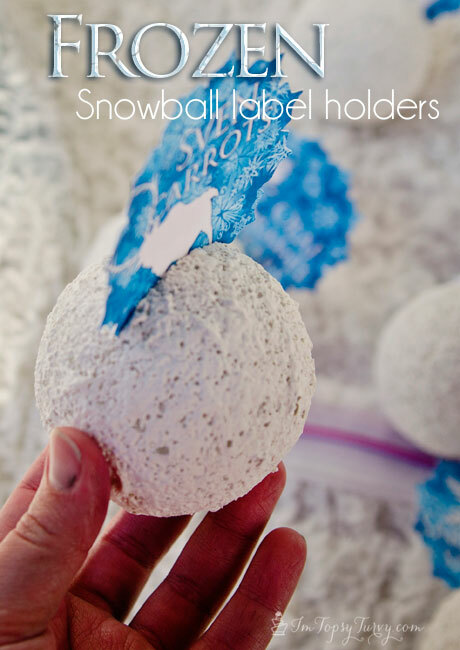 Once they were done and dry I used a serrated knife to cut a slit into the large balls, perfect for the food labels! The kids loved them, they are lightweight too so my boys like to toss them around. I considered gluing them onto a wreath form, but since we had the party outside there really wasn’t a place to put a wreath. But I’m thinking about making one for next Christmas!